Mothhead is an interactive art demo built in Unity by San Francisco-based industry art studio Massive Black. Explore the beautifully dark and whimsical underground grotto as a moth, meet a new friend, and find your other physical half. Solve a simple puzzle allowing you to cross a chasm and make your way outside where you’ll find yourself in a beautiful outdoor environment and be able to free a friend from captivity using a combination of brains and brawn. The Mothhead character and universe began its life in the mind of legendary sculptor and concept artist Peter Konig and lived on in the imaginations of his friends at game and film industry art-house Massive Black. The original Mothhead sculptures, used as the inspiration for this art piece, still adorn the shelves at Massive Black offices. 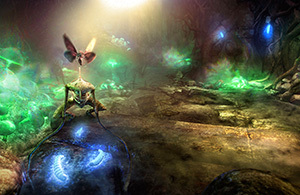 Mothhead is the studio’s first attempt at creating an artistic demo with Unity, and demonstrates just how powerful a tool Unity can be for artists, even for those with a modest technological background. Massive Black chose to use Unity to build Mothhead after being introduced to the tools and found them incredibly accessible and understandable while still providing the power they needed to bring their artistic vision to interactive life. In a few hours, they were able to get a prototype up and running with Unity after having been trying for months with little success using other technology. Until now, the studio has worked primarily doing contract work for publishers and studios that are looking for an artistic edge for their game or film. With Mothhead, they’re beginning to branch out on projects that are near and dear to their hearts. Our hope is that artists and developers around the world will be able to use this demo as inspiration for their own visions of creating AAA level quality visuals in Unity.